One of the less-discussed sides of Pitti Uomo is the number of tailors that set up in a hotel or appartment at the same time as the fair, in order to see customers. 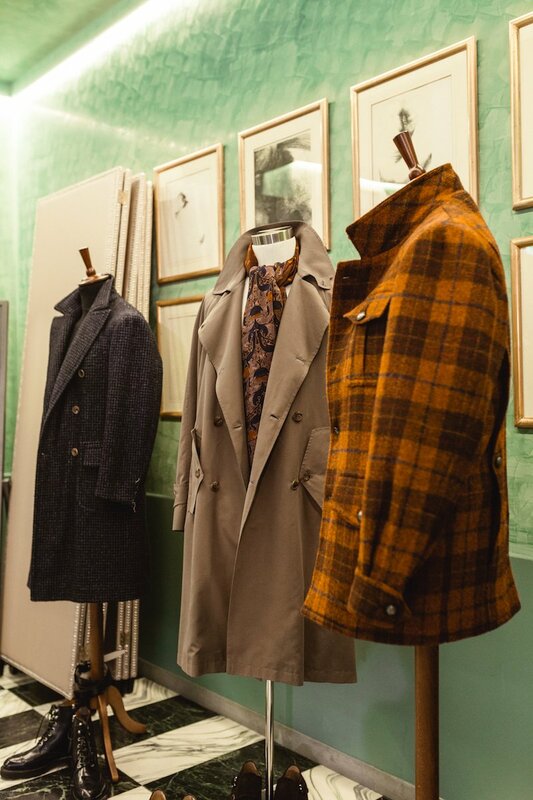 Although most visitors to Pitti are buyers from around the world, those buyers are often good bespoke customers - and sometimes, as with the Japanese for example, it’s the only time of the year they are in Europe. 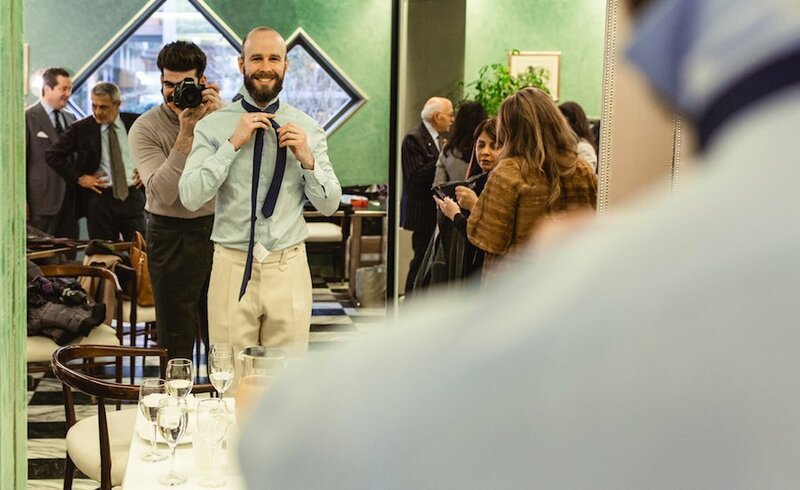 Sartoria Panico and shirtmaker Anna Matuozzo set up in Hotel Minerva, on one corner of Piazza Santa Maria Novella - a nice location and only a few minutes walk from the fair. 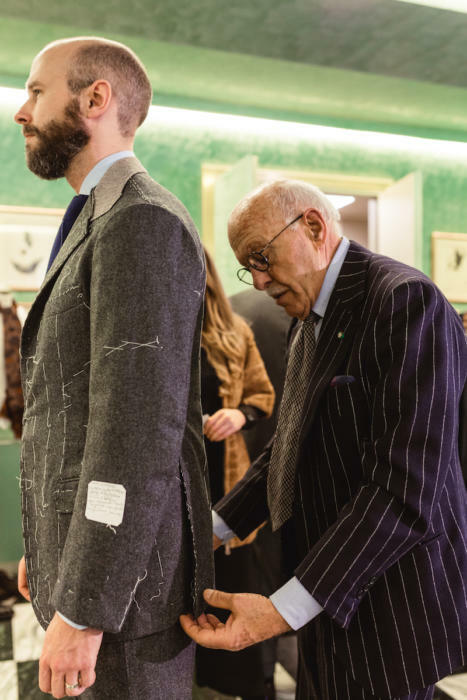 I had my second fitting there with Antonio Panico (above), on the mid-grey flannel suit we are making (and had been fitted once already in Naples). The suit is progressing nicely, with only a couple of small tweaks required at this stage. A nip in at the waist and a bit of ironwork around one shoulder blade. The feeling I had is very similar to that discussed on my recent Sartoria Ciardi suit - of being in good hands, and of the fit and pattern being good from the very start. The shape is pleasing, the back clean but with still enough room to move, and the collar nice and flush on the neck. Look at the number of stitches on the collar, by the way (below). Although it’s debatable how much difference this makes to a jacket, it is more stitching than most Neapolitans, and certainly shows you how much work is going into the suit. Incidentally, I decided to make two pairs of trousers with this suit, one high-waisted and one low. Although I generally don’t wear high-waisted trousers with braces (see my logic here), I do recognise how flattering they can be, and I thought grey flannel would be a very versatile cloth to experiment with. Even if I don’t end up wearing them with this suit, I will wear them elsewhere (eg with shorter casual jackets perhaps - such as my Gieves bespoke leather). I’m also trying double forward-facing pleats for the first time. Although I don’t like the look quite as much as backward-facing ones, they may well be more practical on me given how much my seat and thighs pull at the cloth. Looking back on these photos now, I remember how exhausted I was after a long day of rushing around Florence - and yet how comfortable in my cream trousers and roll neck. I think it’s another point in favour of the roll neck, as a very smart, sartorial piece in the wardrobe, that is also extremely comfortable and therefore good for travel or long days of walking. The charcoal roll neck, by the way, is from Drake’s, and the trousers are from Pommella in the ecru Fox cloth that they re-wove recently (still a waiting list being operated for that, here). 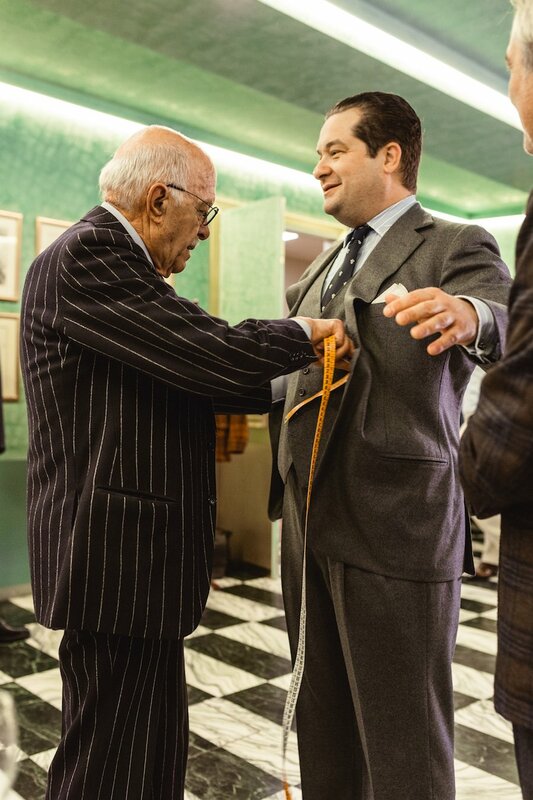 Pictured with me is Simone Ubertino Rosso from Vitale Barberis Canonico (above). 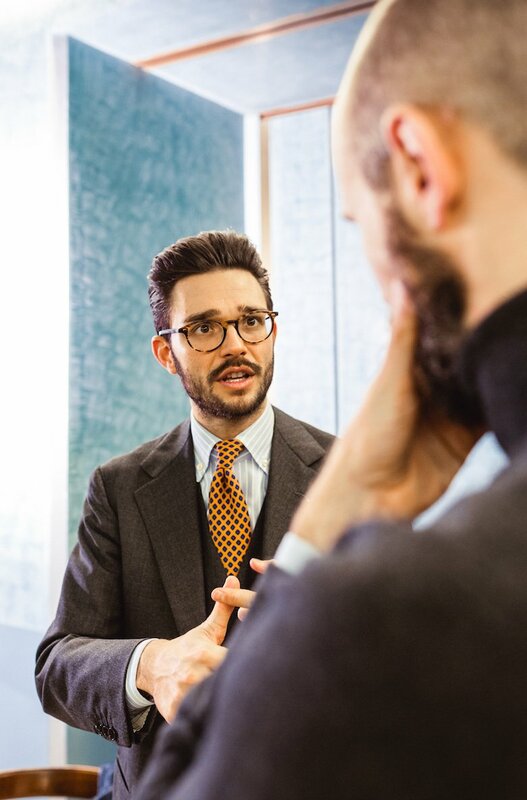 Simone is always a great ambassador for VBC cloth - here in his charcoal worsted, blue/white striped shirt and bright orange tie with a small geometric design. The always enthusiastic Francesco Vitale Barberis (below) was there with Simone, being measured for a Panico suit. He went for a more widely striped blue/white shirt. Elsewhere Panico had on display a few more unusual bespoke designs they offer (something so few tailors do well). These included a raincoat and a flannel hunting jacket. The full review of the Panico suit should be ready will be in a month or so. 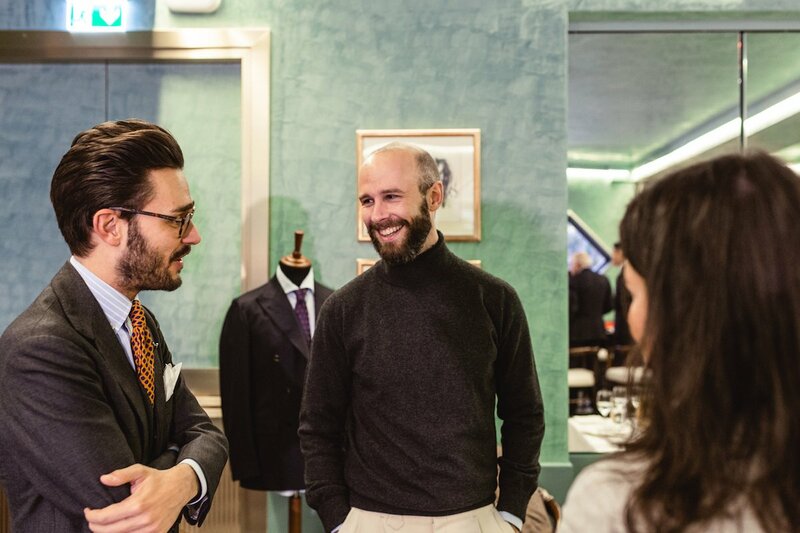 You can follow the discussion on Sartoria Panico fitting (and a roll neck for a long, hard day) by entering your email address in the box below. You will then receive an email every time a new comment is added. These will also contain a link to a page where you can stop the alerts, and remove all of your related data from the site. 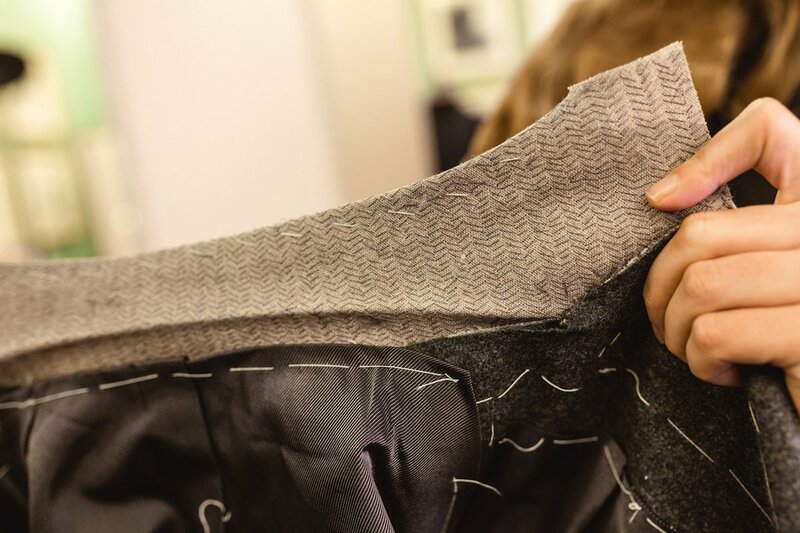 Forward pleats are considered more traditionally British, whereas reverse (NOT backward) pleats are more normally found on continental tailoring. We don’t often see you wearing a blue/purple tie: where did you get this one from please? Simon you are a lucky guy, Panico is a true master, a walking hero of world tayloring. Clever choice to do 2 pants. And thanks fr the detail of the collar just amazing. Hi Simon, I (like you) enjoy wearing a roll neck. However, whilst your slim torso makes a roll neck look more elegant, my bulkier torso can make me look like my head is a piece of toothpaste being squeezed from a large tube! For bigger guys I find that slipping a jacket, gilet or cardigan over a light or medium weight roll neck avoids the ‘toothpaste tube’ look. Do you get rid of existing jackets and suits as you acquire new ones? It would be interesting to include a sentence or two on what you discard for each new commission and why you chose to get rid of that item. Interesting point. I’m not as strict as that, but I do do periodic givings away to friends and family. Next time I do that I’ll perhaps run through what I’m getting rid of. Have you ever considered offering an auction/lottery to PS readers for the discarded items? I’m sure there would be great interest in these items! Which naturally begs the question: what rtw size do you fall into, Simon? May one ask, per chance, why thou has opted along the avenue of pockets with flaps as opposed to teadional Neapolitan patches? Always been very curious on Panico given his (outsized?) 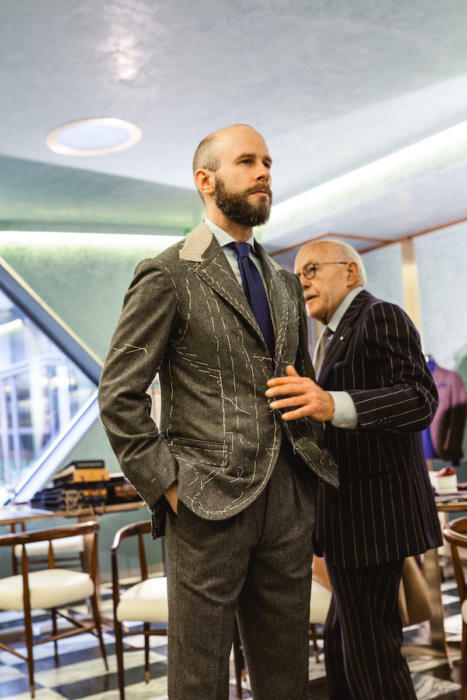 reputation in the Neapolitan tailoring world, and would be interested to see how this turns out. One minor quibble – it’s reverse, and not backward, pleats. I look forward to and greatly enjoy reading this blog . However this morning it was a case of “(sigh) another piece on an unaffordable Italian Suit !”. I exaggerate but do you find the ‘clothes wearer’ side of you noticing very little from one Italian suit to the next ? As opposed to many years ago when you would have noticed bigger differences? Secondly , and sincerely , how do you reconcile articles for your (early readers) less ‘economically disposed’ readers with your more luxurious readers ? P.S. constructive criticism at a blog and blogger who I greatly admire and whose direction I am concerned about. Thanks Robin, and points taken. I do still notice significant differences, and I find them increasingly interesting, perhaps as my tastes have become refined over the years. I also, probably naturally, want to try the finer things. However, i do always include other observations, about roll necks, about fit, about flannel and so on, that could apply to any price range. Finally I do try and add pieces like Saman Amel that are more affordable. Always open to doing more of those. How many suits do you generally have being made at any one time? I too once thought I’d outsmart my tailor (who has decades of bespoke experience, unlike you and I) and have him make my trousers with forward pleats and without the higher waist which normally are paired with braces. I soon learned the stupidity of my conceit, had the pleats removed, and had all future trousers made with the rise my tailor had determined would be right for me. The result of following my tailor’s experience and wisdom are trousers which are sleeker, more flattering and more comfortable than those which were designed by my misbegotten instinct. I use soft silk suspenders, similar to tie silk. They are imperceptible on my shoulders and, when necessary, an extra moment or two in the toilet has never harmed me sartorially one single bit. I think the trousers look very well with the high waist and forward pleats and if you wear a waistcoat then there is no shirt visible. I found the amount of padding on the collar and some of the basting on the coat disturbing as it smacks of dressing the fitting up for the customer. I would have preferred to see a more honest approach after all you are buying a suit not a theater ticket! 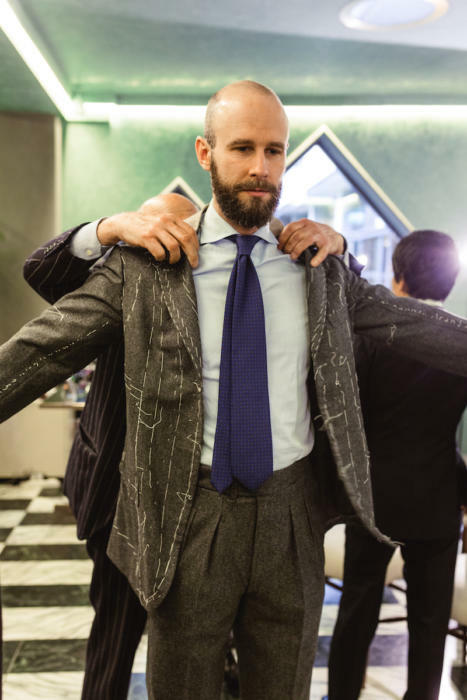 which of these Sartoria would you prefer: Panico, Ciardi, Dalcuore, Solito, or are the differences too small to say that? Have a look at my review of the finished piece with prices, here. There’s also a first, introductory piece here.